IMRRA researches threats and vulnerabilities to safer vessel management. Undertaking Risk Mitigation, Risk Management and KPI Safety Measurement for its customers. Your three-stage vessel safety risk rating identification process. Quickly look-up the vessel and the corresponding traffic-light safety rating, Red, Amber or Green risk warning. Or use IMRRA’s Advanced Search Information to find the vessel you need. 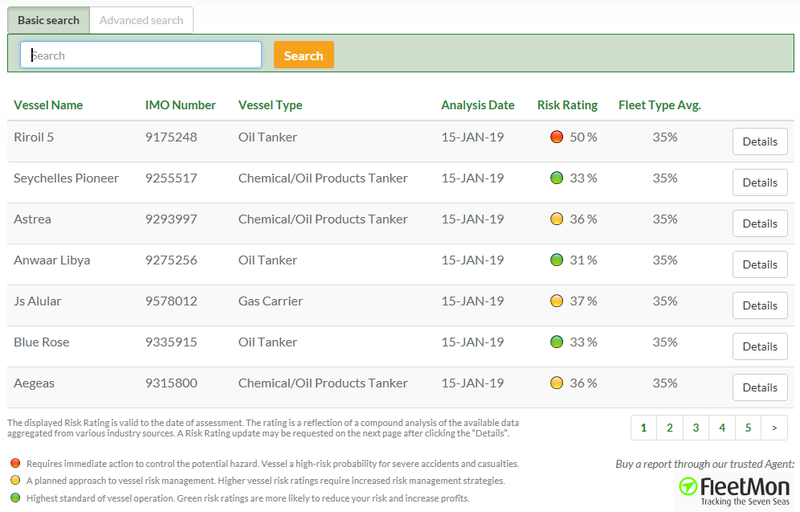 Examine the vessel’s risk rating percentage against the Fleet Type Average to view the vessel’s safety risk profile and the risk to your business. What causes Red vessel risk ratings? Major recent casualty or incident, long term poor vessel safety and maintenance histories contribute towards red warnings. A planned approach to vessel risk management, apply temporary risk management as required. What causes Amber risk ratings? Due to change of risk factors including: Casualty & Incidents History, Classification Society (Change of Class), Technical Manager Fleet Performance, Vessel Particulars, and/or Dynamic risk factors, inspection results, vessel casualties and detentions, Technical manager risk profile. A high standard of vessel operation, Green risk ratings are more likely to increase your profits. Example data includes: All trading certificates are in date, no legislation infringements in place, crew matrix requirements met, Operator risk profile and casualty history is acceptable, trading certificates are up to date, ship survey, terminal safety inspections, detentions. Vessel risk rating Amber? Last report over three-months old? Vessel risk high compared to the fleet average? Concerns on the vessel’s risk rating percentage? 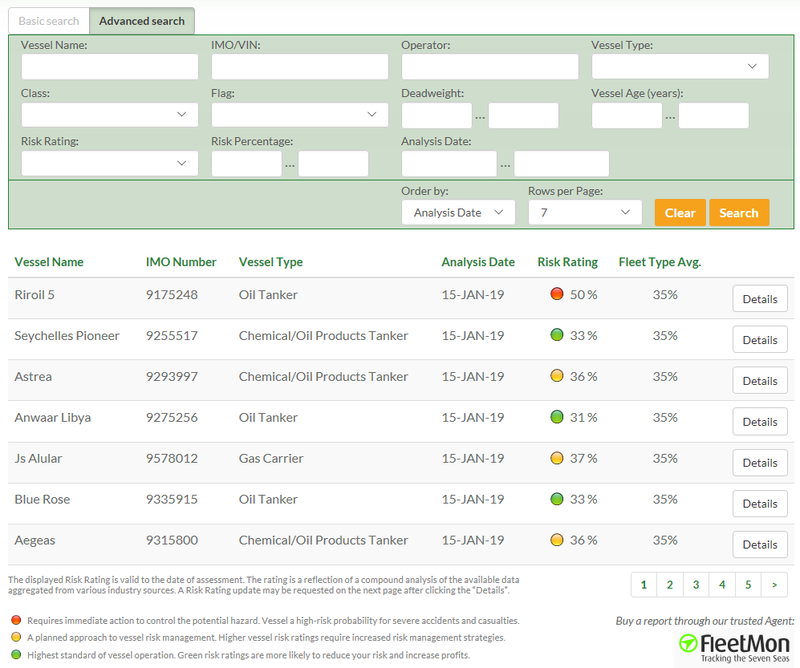 Require the latest vessel risk rating report to manage your company’s risk? Or leverage your negotiating position for an improved commercial offer? Does the vessel’s risk rating report have the latest PSC information and detention information? Special surveys up-to-date? Urgently need the latest vessel information available? Then it’s time to purchase a new vessel safety risk rating report! New reports are emailed within 4-hours to you can be ordered upon registering for your free-14-day trial subscription. Annual subscribers order directly from their pre-paid account. Contact IMRRA now at marinerating.com/contact to find out about how to purchase risk rating reports. Purchase a new vessel risk rating report by visiting marinerating.com/register. Or order via our agent FleetMon.com.